Marinelli VT-1419 Violin Rental Outfit - Available in 4/4-1/16 sizes. Bellissimo Dexluxe BV-120 Violin Rental Outfit - Available in 4/4-1/8 sizes. Marco Cabrelli Argento Violin Rental Outfit - Available in 4/4-1/8 sizes. New! Request a Prepaid Shipping Label and Pickup for Your Rental Return. No obligation after the upfront rental period. Return at anytime. Purchase option is included with rental. May apply up to 18 months of paid rental fees toward optional purchase. Hunter Electra Red Bb Student Clarinet Description: Specs: Key of Bb, ABS Body, Nickel Plated Keys. Accessories: Clarinet Case, Clarinet Mouthpiece, Cap and Ligature, Rico Reed and a Clarinet Care and Maintenance Kit. 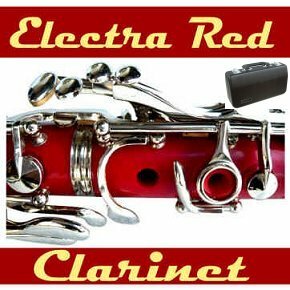 This Hunter Electra RedStudent Clarinet Rental is great for the first time student looking to add a little color to thier playing style and includes everything you need to get started learning the clarinet. Brands will vary with this selection. Select from 3, 6 or 9 month rental options. Rental goes to monthly billing at the end of the up front rental period you select and you may return at anytime. There is a purchase option with every rental which allows you to apply up to a specific amount of paid rental fees toward the purchase of your instrument. There are economical advantages to paying for a larger block upfront and those options and discounts may be reviewed above. We can ship your clarinet rental anywhere in the USA! Order Online Now. Click here to hear a Bb Student Clarinet Sound Sample. Order Your Music Instrument Rental Online Now - Easy Approval - Nationwide Shipping. 2016 JST Mailhouse, Inc. 888-890-0524 - MusicRentalCentral.com - We do not service, HI,AK,PR or any non-mainlaind US location.